Welcome to Maryland Primary Care Physicians at Arundel Mills. 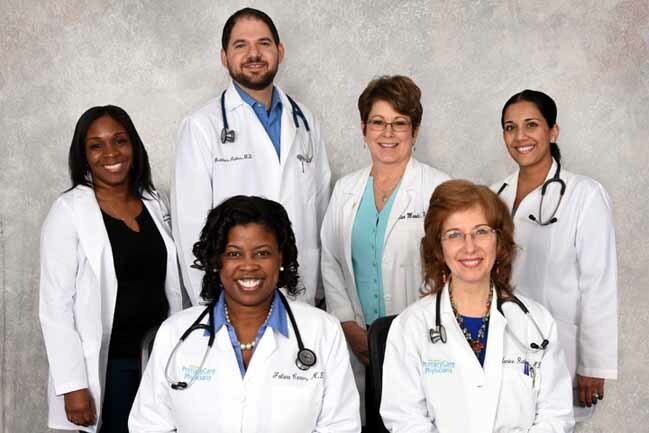 Our providers are board-certified in family practice and internal medicine, with extensive experience in all aspects of primary care: pediatrics, women’s health, adult and geriatric care. Our practice offers high quality comprehensive medical care to patients of all ages, with emphasis on preventive care. We also provide a number of on-site tests focused on early detection and treatment of chronic illness, and have an on-site lab for your convenience. It is our hope that you will find your visits with us accommodating, pleasant, and medically excellent. In order to make sure you derive the most benefit, please take time to familiarize yourself with our system so we can, in partnership, promote and improve your health. We have provided this letter to help you better understand our practice so we may better serve you. Our office and phones are open 7 a.m. – 7 p.m. Monday- Thursday, 7 a.m. – 5 p.m. on Friday, and 9 a.m. – 12 p.m. on Saturday. If you have an urgent problem when the office is closed, a message on our answering machine will give you a number to call for the on-call doctor. This number is for emergencies only and is not intended for routine refills, referrals, narcotic prescriptions, or second opinions about on-going care. All patients are seen by appointment. A photo ID will be required at every visit. We advise you to call as early in the day as possible if you or your child is ill, as we try to see all sick patients on a same day basis. Reminder calls are made 48 hours prior to the appointment. It is your responsibility to keep your appointment and the appointment for your child. We understand that there are occasional circumstances that might keep you from the appointment. When this happens, we request at least 24 hours of advanced notice. Your plan requires that you present your insurance card at the time of service. As a courtesy we will bill your insurance if we are not a participating provider. This may require you to have a higher out of pocket expense. Please check with your plan prior to making an appointment. Although we will assist you, it is ultimately your responsibility to be aware of the extent of your coverage, limitations and exclusions before the time of service. This includes well child care and immunizations. If you have a co-pay or deductible, your plan’s contract with both our practice and you requires us to collect this at the time of service. Some of the insurance plans have limited our ability to perform lab tests on site. If you need a lab test, we will provide you with necessary documents and instructions to have this test done at an outside lab. The results will be sent to us, and we will notify you. With the exception of a medical emergency, referrals will be prepared within 3 business days of a request. Referrals have expiration dates, so be sure that your appointment with the specialist is within your referral expiration period. Please allow 3-day notification for referrals to be generated on your behalf. Provide the name of the specialist and reason for the referral. Referrals may be picked up in our office or mailed. We will only fax referrals to a provider’s office. We are not permitted to issue retroactive referrals. Please contact our receptionist if you have questions. All new problems not yet evaluated at this office will need to be addressed here before a referral is given. For an existing illness, a 6-month follow-up will be done prior to issuing a referral for continued care, unless otherwise stated by the physician. Please allow 72-hours for refills to be issued. When calling for refills, stipulate the name and strength of the medication requested. Refills for medication prescribed by other physicians should be obtained by the specialists unless there is documentation from them on the chart. All birth control pills and hormone replacement refills will be given for a period of one year as long as there is a PAP result and/or mammogram result on the chart, unless otherwise stipulated by the physician. Refills will be given as long as follow up visits are up-to-date. (See follow up visits). For diabetic patients, the usual follow-up appointment is every 3-months including fasting (12-hour) blood work. For hypertension and high cholesterol, the usual follow-up (once controlled) is every 6-months. For patients on Coumadin or Warfarin, you must be diligent about your blood work; the frequency of which will be determined by the physician, depending on stability of the findings. You must comply with getting blood drawn when requested, since Coumadin excess or deficiency can lead to severe consequences for your over-all health. Your provider may ask that you have it done very frequently at the beginning of treatment and the frequency should diminish as results stabilize. Even when stable, you will need to have a blood test done at least every month. Please leave a reliable phone number with the office so you may be contacted promptly about results. Expect to have your physical about 4-6 weeks from the time you schedule it. What is included? A physical includes a complete review of your current concerns (if any), past history, medication history, family and social histories. A review of any other symptoms will be conducted and you will be examined from head to toe. GYN exams are separate exams and will not be conducted at the same time. Routine blood work for the physical will include a complete blood count, a comprehensive chemistry profile and cholesterol. If you are female, a thyroid test and urine analysis will also be performed. Any other testing will be done at the doctor’s discretion depending on your personal and family histories. The blood work results will be sent to you within 2-weeks of the blood draw. DOT physicals will need to furnish their paperwork for us to fill out since the office does not have them at our disposal. Pre-op exams should be scheduled within a month of surgery and you will be requested to hand carry the orders to be done as requested by your surgeon. Allow at least 3-days before surgery to have the results return in time to be faxed to the surgeon. Medicare physicals are actually risk assessment visits to determine the probability of patient injury/illness based on history and home environment. Risk assessment goal is to decrease the chances of injury or illness but addressing living conditions or life styles. Medicare does not pay for a complete blood evaluation or a classic “hands-on” physical. The blood work, if ordered, must be tailored to the individual’s risks and diagnoses. We are always willing to do additional blood work per patient request but this must be billed to the patient directly. The blood work ordered is dictated by your underlying medical condition and your main concern at the time of the visit. Complete blood work-ups ordered during visits for minor concerns are not usually covered by insurance. Most insurance, other than Medicare, will cover annual physicals, at which time a more comprehensive screening may be done. If the blood work is found to be normal or acceptable, the results will be mailed to you and you should receive them within 2-weeks of the blood draw. Please do try to wait for these to come in the mail. If at the end of 2 weeks, you have not received results, please call our office to notify us. If the blood work is unexpectedly abnormal, you will receive a call-back from the office as well as a routine letter. You may expect a call-back from the physician within 24-48 hours after a message to call is left. If it is imperative you speak with the doctor more urgently, let the receptionist know at the time of the call. We make every attempt to answer all our messages as promptly as possible. We know your time is important and we strive to serve you as close to your appointment time as possible. In order to be able to accomplish this goal for each patient, we request you be on time for your appointment. The office allows a 15-minute grace period before canceling your appointment. If you are a new patient, please arrive at least 15-minutes before your scheduled appointment, to allow time to complete the requisite forms. If you will be unable to keep your appointment, please call to cancel at least 24-hours in advance to avoid a charge of $35 for a regular visit, or $50 for a physical examination visit. If you need to have forms or a letter filled out after your visit with us, there will be a nominal charge for this service. The fee is dictated by the brevity or complexity of the task. We will submit our charges with your insurance carrier if we contract with the plan. In order to file, we need a current copy of the insurance card. If you do not have evidence of current insurance with one of our doctors as a primary care provider, or if your child is not covered under any insurance, you will be required to pay in full when services are rendered.